The product in this post was given to me as a gift. All opinions are my own. Heyo everyone! Today's Neverending Pile Challenge is holo, and do I really need an excuse to wear holo polish? NOPE! 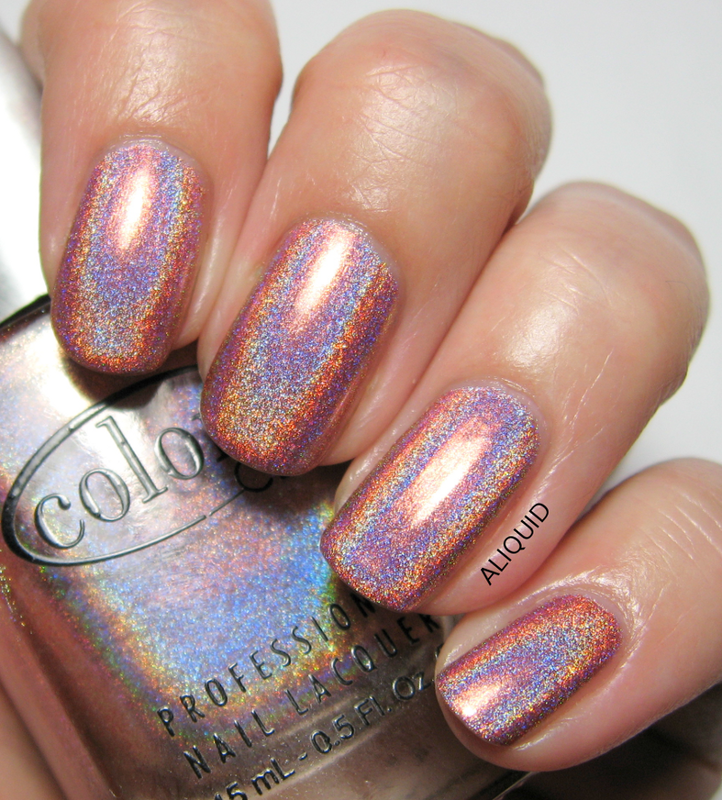 Here's Color Club Cosmic Fate--wow, look at those rainbows!! Color Club Cosmic Fate. Two coats with Out the Door topcoat. The holo effect in all the Color Club Halo Hues is just amazing. (And remember, this photo was taken under a lamp indoors...imagine what this polish looks like in sunlight!) The base color of Cosmic Fate is a sort of brownish coral, but the holo pigment makes it look coppery a lot of the time. It has a great formula, very forgiving for a holo--you can do several strokes per nail without dragging, and you don't need to use a special base coat. The polish's consistency is just about perfect. And topcoat doesn't weaken the holo effect, as you can see! Ah this is stunning! I love holographic colors.